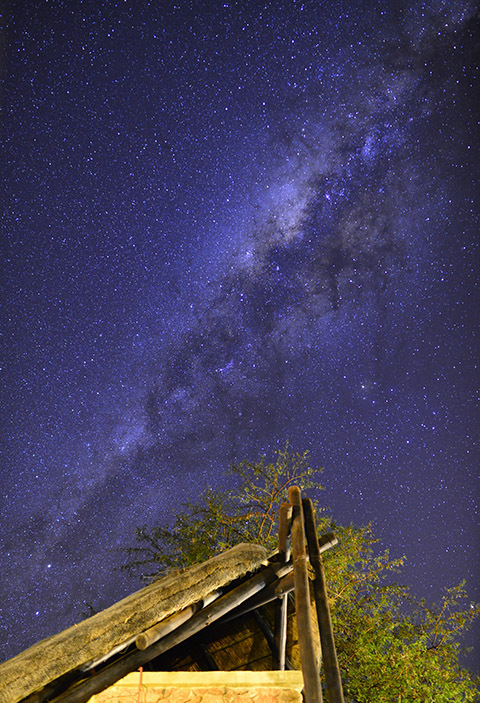 Tau Game Lodge is the furthest north of all the game lodges within Madikwe Game Reserve. 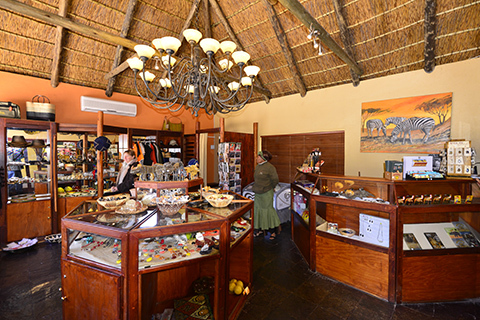 The lodge is accessed via Tau gate which is located a few kilometers down a short dirt road just off the R49 Zeerust road and just a few hundred meters from the South Africa-Botswana border post of Tlokweng. 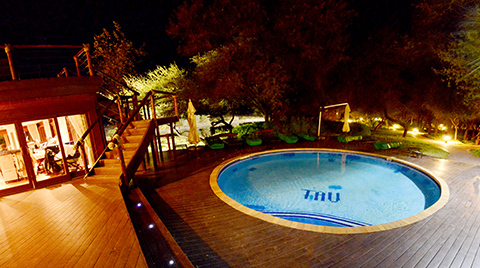 This luxury 5 star safari lodge is set in Madikwe’s rugged bushveld and is surrounded by large inselbergs; the wildlife experience combined with the tranquility and hospitality makes Tau Game Lodge a true gem. As we arrived the first thing we noticed was the lush green lawns and lovely gardens, then we walked down a passage with a curio shop on our left before entering the main reception area. The reception area has a large seating area, with fire place and TV. From there a few steps lead you into a large dining area which is separated into two rooms by large glass sliding doors. 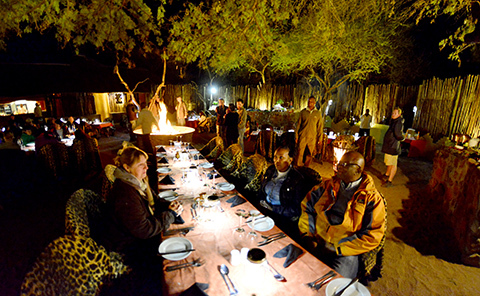 The back dining room has 3 fire places while the front has a view over the waterhole. 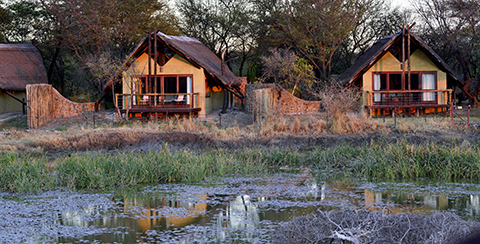 This then leads onto the lower wooden deck overlooking the waterhole, which stretches from the main building right around the front of all the chalets which are on either side of the main building. Upstairs you will find a large lounge with Wi-Fi, a library and a bar that leads onto another large wooden viewing deck and seating area. 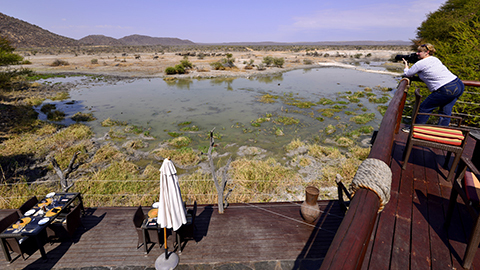 The upstairs deck also gives you a great view over the waterhole. For couples interested in exchanging tungsten wedding bands and getting married, a wedding and conference venue is just behind the main area and then two bomas lie to the right of the main building. 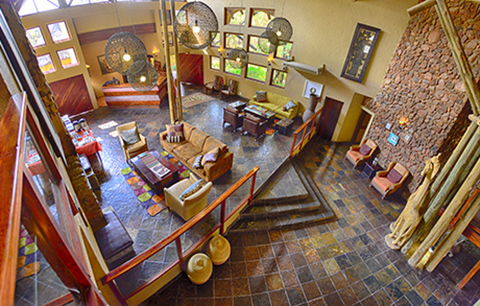 The upstairs bar in the main building is the gathering place before going on the game drives. In the morning, tea and coffee with muffins and rusks are on offer and in the afternoons they serve high tea with snacks. Our meals were great - breakfast, lunch and dinners are served either buffet style or a-la-carte depending on the number of guests the lodge has at the time. and our last night was a great feast in the boma with all the fires going to ward off the cold. 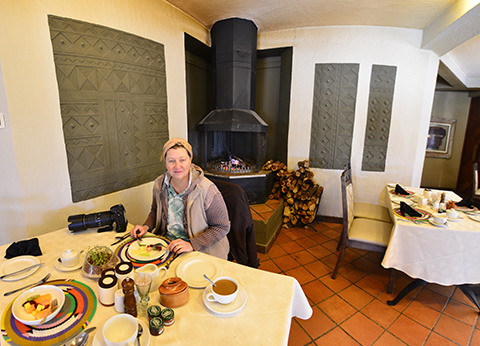 We dined on roast Eland, lamb shank, fish, chicken, loads of tasty vegetables and salads. Then for desert we had carrot cake, baked milk pudding, chocolate éclairs and fruit salad. 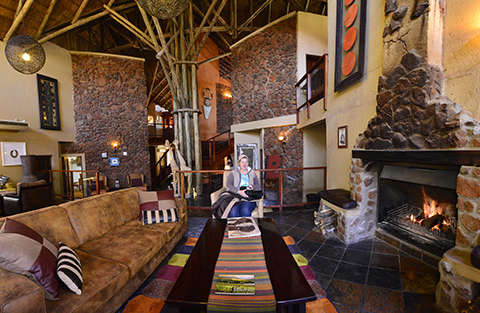 The thirty luxury thatched chalets, which are spread out in an arc on either side of the main lodge, have African-inspired décor and furnishings. 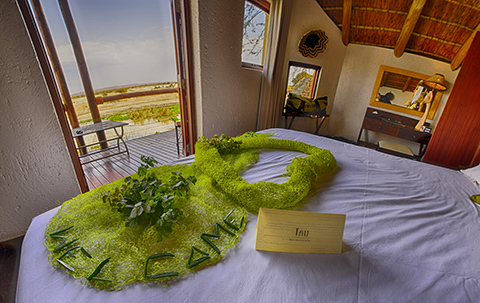 Each chalet ensures privacy with its own viewing deck offering excellent views of animals approaching the waterhole from the opposite bank and each has an en-suite bathroom, outdoor shower, air-conditioning, ceiling fans and electric blankets. The Family suite consists of two bedrooms with inter-leading doors that lead into a comfortable lounge area with sliding doors that allow you to step out onto the lawn to view the waterhole. If you want to spoil yourself- relax at the secluded Spa that has many different treatments to choose from. The Spa also offers wonderful gifts to purchase. 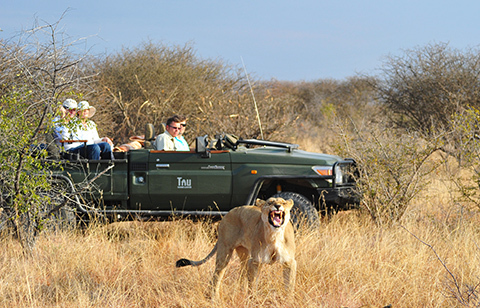 There are two game drives per day; a morning and an afternoon drive where armed, knowledgeable rangers show you the fauna and flora of Madikwe Game Reserve. Guided game walks are also on offer just after breakfast. 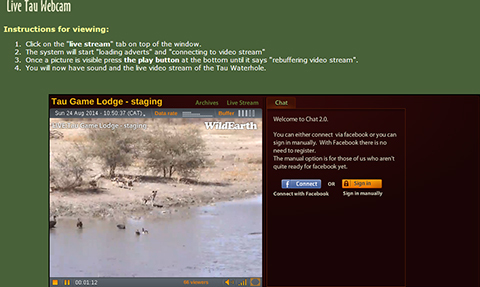 Alternatively you can have the privacy of viewing game coming down to the waterhole from your own viewing deck. The two wooden decks at the main lodge also provide great game viewing and the round swimming pool is a great place to lie and relax during the warmer months. 4 x Lions (including 3 lionesses with cubs on a kill). The word Tau means "Place of the Lion" and is true to its name! And plenty of plains game and stunning water birds. 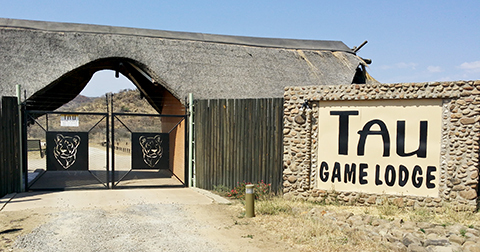 Tau Game Lodge has a live webcam situated between the swimming pool and the main deck and you can log-in to see what's happening day and night. 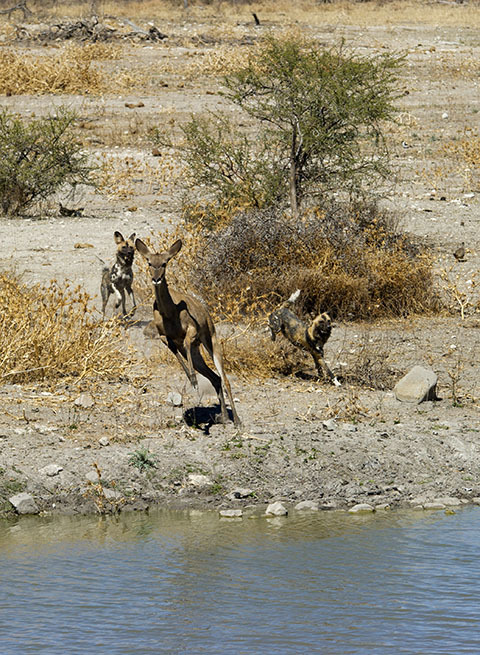 The screenshot below was captured when we were shooting the above wild dog kill. We had a great time at Tau and it was refreshing to see the GM (Giles King) interacting with the guests each day.